After the two previous conferences in 2009 and 2012, and the FIT Congress of 2014, which were all held successfully in Berlin, the Bundesverband der Dolmetscher und Übersetzer e.V. (BDÜ) will once again organize a three-day international conference on 22-24 November 2019 in Bonn, as part of its series „Übersetzen in die Zukunft“. and will place the focus on how the digital revolution is altering the work of translators and interpreters, cooperation with customers, and the provision and procurement of language services, and thus puts many business models of free-lance translators and interpreters, language service providers, and in-house translating services to the test. Some of the lectures and discussions will be interpreted simultaneously into German and English. In short seminars and workshops, interpreters and translators will have the opportunity for continuing education in various specializations, for updating their knowledge, or to obtain an initial orientation about a specialization they may be considering. 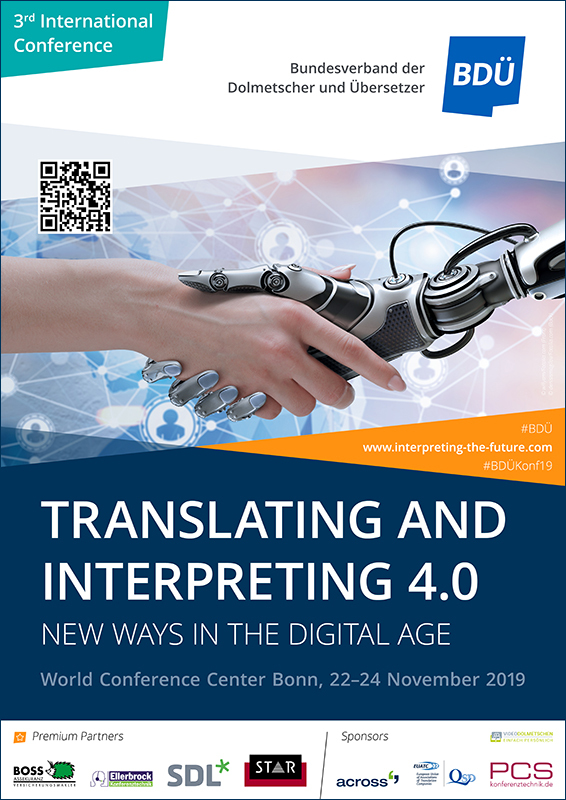 At the accompanying trade fair, the visitors will be able to inform themselves about systems for machine translation, translation-memory systems (CAT), tools for information management, the latest reference works, and services for translators and interpreters. In a networking point and job fair, interested persons will be able to introduce themselves to well-known firms and institutions, and make direct contacts with potential employers or clients, as well as with colleagues with the same or complementary specializations.